Cooperstown, N.Y. - Around the Year, a new exhibition at the Fenimore Art Museum, illuminates the changing seasons and special annual celebrations with outstanding, rarely-seen examples of Tasha Tudor&apos;s original art for greeting cards, children&apos;s books, and holidays-from Christmas and Easter to Valentine&apos;s Day and the Fourth of July. 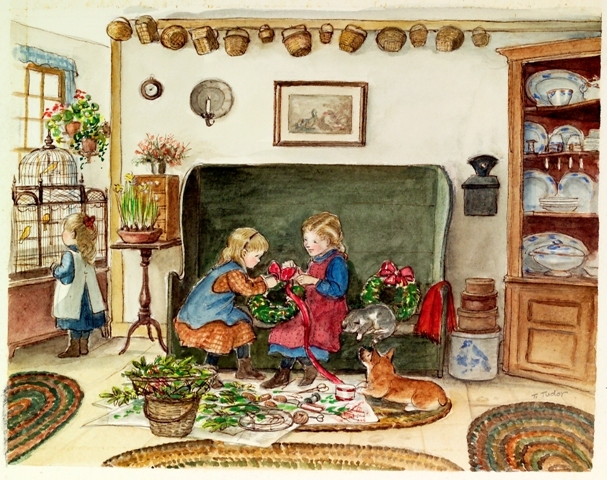 As one of the most beloved artists of our time, Tasha Tudor (1915-2008) delighted an international audience with her joyful writings and enchanting images. See outstanding examples including evocative watercolors, delicate childhood drawings, original handwritten manuscripts, miniature doll cards, hand-decorated boxes and Easter eggs. Personal photographs and first-issue holiday cards are among the treasures to be enjoyed. Tudor&apos;s heartwarming images remind us of the simple pleasures to be savored in each passing season and the small, special moments that make up the fabric of our lives. Deeply rooted in her personal aesthetic and philosophy, Tudor&apos;s timeless images engage the eye and the imagination, providing continued inspiration for generations of readers. The exhibition opens October 1 and will be on display through December 31. The exhibition&apos;s co-curator, Jeanette Chandler Knazek, visits the museum on October 17 for a gallery tour as part of Food for Thought, the museum&apos;s lunch-and-lecture series. Registration is required for this exceptional program. Knazek returns on November 27 for a public lecture at 7:00 p.m. The exhibition is sponsored in part by Upstate Temperature Control. For more information about the exhibition, please visit FenimoreArtMuseum.org. To register for Food for Thought, call (607) 547-1461. Tasha Tudor: Around the Year has been organized by the Norman Rockwell Museum in Stockbridge, Massachusetts. Photo Credit: Tasha Tudor, Untitled, 1973. 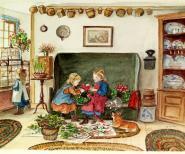 Illustration for a Christmas card (1973) and Drawn from New England (1979) by Tasha Tudor. Watercolor on paper. Collection of Jeanette and Gerald Knazek. 8.5" x 9.25" ©1973 Tasha Tudor. All rights reserved. For more information or images, please contact: Todd Kenyon, Public Relations New York State Historical Association Fenimore Art Museum/The Farmers&apos; Museum Phone: (607) 547-1472 / E-mail: t.kenyon@nysha.org About Fenimore Art Museum The Fenimore Art Museum, located on Otsego Lake -- James Fenimore Cooper&apos;s "Glimmerglass Lake" -- in historic Cooperstown, New York, features a wide-ranging collection of American art including: folk art; important American 18th- and 19th-century landscape, genre, and portrait paintings; an extensive collection of domestic artifacts; more than 125,000 historical photographs representing the technical developments made in photography and providing extensive visual documentation of the region&apos;s unique history; and the renowned Eugene and Clare Thaw Collection of American Indian Art comprising more than 800 art objects representative of a broad geographic range of North American Indian cultures, from the Northwest Coast, Eastern Woodlands, Plains, Southwest, Great Lakes, and Prairie regions. Founded in 1945, the Fenimore Art Museum is NYSHA&apos;s showcase museum. FenimoreArtMuseum.org Listed in USA Today as one of the top 10places to see art in small cities, The Fenimore Art Museum offers spectacular art to match its spectacular setting on Otsego Lake in scenic Cooperstown, New York.